There’s one of two ways you can go about opening a tournament; become everyone’s new favourite team, riding a wave of World Cup fever or receive damning indignation as fans slowly adjust from the high standards of the European club football season. Saudi Arabia went by no half measures down the latter route, becoming an overnight laughing stock after not only being thumped comprehensively, but at the hands of the lowest ranking side at the tournament, hosts Russia. The insults, the derision, the pity, it’s been a difficult week to get over for Saudi Arabian fans. The concerning point is that the damage could well have been mitigated in advance. We’re all aware of the short period Juan Antonio Pizzi has had in charge of the Green Falcons; turning them from a cautious, functional unit, to a free flowing, possession based attacking side has been a long, hard slog, but the green shoots were starting to emerge. Preparation matches against Italy and Germany saw the emergence of fruit from Pizzi’s labour, a team that was starting to understand how he wanted to counter their superiors and cause a shock in Russia. French coach Didier Deschamps jokingly suggested this week that every team at the World Cup was prepared, apart from Saudi Arabia. Could the truth be they were too well drilled in just one system? A style of play that was quickly countered and finished off to precision by Russia, who had done their homework expertly ahead of their opener. Any success that Saudi Arabia were likely to achieve would come on the counter, winning back possession high up the pitch and creating chances on the transition. One thing they didn’t want however, was too much possession, especially in their backline. Saudi Arabia indeed however did dominate possession (60% against the hosts), and while each of Russia’s goals resulted from a sloppy turnover in play, pass completion rates were remarkably high (86% to Russia’s 78%). The midfield three kept it well but lacked penetration, but it was in defence where Russia hit hard, capitalising on the lower technical skill of Omar Hawsawi in particular when he was asked to bring it out from the back. Ironically as they prepare to take on Uruguay, the best side in the group on paper, Saudi’s counter approach will likely provide better results than it did against the hosts. Finding the likes of Salem Al-Dawsari and Fahad Al-Muwallad in space in the final third is key, and needs to be done quickly, something painfully missing last Thursday. We have all got beautifully, and this time fully, Queirozed. Yay! Carlos Queiroz got it all right, while getting at least satisfactory performances from all his top men. Since Renard went all in, with Harit and Ziyech providing vertically oriented attacking outlets for Belhanda and Boussoufa, concentration levels of Iranian players needed to be higher than at any point of WC qualifiers, and they very much were. While Jahanbakhsh and Ansarifard were guilty of switching off every now and then, Pouraliganji’s anticipation at the back was mostly spot on, Ebrahimi was cleaning it up in front of him and the surprise starter Amiri covered so much space and so many players, he pretty much connected all the remaining dots. Iran looked disciplined, yet tactically flexible; almost all we could wish for. In the tactical battle I was by far most looking forward in the Round 1, Queiroz managed to adjust while Hervé Renard barely did. Iran started off pushing rather high for their standards, getting caught by some tricky diagonals early on, as Morocco mostly targeted wide areas. Then, after Team Melli dropped a bit deeper, Morocco seemed largely unable to find the breakthrough. And finally, as Queiroz increasingly smelled Moroccan desperation, Iran started pushing forward a tad more again, now with substitute Ghoddos on the pitch, and boom, the goal came. Morocco got ultimately unlucky, of course, since they conceded via an own goal, but really… not really. To be fair, while the defending part was done to near perfection by Iranians – only Ansarifard being unable to put in a meaningful tackle, whereas Beiranvand and Cheshmi both stuck it up to their numerous critics rather convincingly with their surprisingly reassured play – the attacking part left quite a lot to be desired. Even putting aside Sardar Azmoun not doing what we usually expect from him on a breakaway (twice! ), there were still notable reserves. From a hesitant, slow Shojaei to largely invisible Ansarifard, especially the central midfield was hardly useful, with defensive midfielder Ebrahimi coming up with the most alert, even outright brave passes. Iran therefore laid down a very nice defensive foundation. Their resolute tackling, a necessary pinch of cynical play and, above all, wonderfully reactive defensive structure which showed no signs of disruption even amidst the wild rotation of Moroccan attacking players (again, credit Ebrahimi’s and Pouraliganji’s superior reading of the game) will all be much useful against Spain and Portugal. But Iranian attacking players need to step up. Maybe bringing in Dejagah who was so brilliant four years ago against Argentina could be an answer, Ghoddos also seem positive once coming on. But one thing is for sure: it won’t work in the initial setup. VAR controversy steals the spotlight from a solid yet pointless start for the Socceroos. In what will go down in World Cup history as the first match to see a goal result from a VAR decision, Australia will equally remember a high quality performance that pushed one of the pre-tournament favourites to the wire. Any doubts over van Marwijk have surely evaporated after an impressive run up to the tournament and group stage opener, that looks to have gelled his famed defensive astuteness, with former coach Postecoglou’s assertion to possession from the back. Considering the three goals scored, it’s hard to highlight any as illustrative of the general flow of the game. The VAR penalty decision was highly debatable, Australia’s equaliser came through a brain explosion from French defender Samuel Umtitti, while the French winner was a freak own goal which could well have been a timely clearance. It might be foolish to wipe the slate clean, given goals ultimately affect the outcome, but these in particular felt to run separate to the general proceedings of the 90 minutes. The course of the match was in Australia’s hands for the most part. While the French tinkered a number of systems, in hope they could break down the Socceroos’ backline, the Green and Gold dictated possession from deep, owned the physical advantage in the centre of the pitch and looked a threat from set-pieces. The defence, especially centrally looked a completely different proposition than the flakey performances that ended Postecoglou’s tenure at the end of qualification. Trent Sainsbury looked calm, thoughtful and strong when he needed to be, while the confidence spilled over to partner Mark Milligan, who arguably had his best game for Australia while playing in defence. There were concerns to be had at right back, with Josh Risdon finding France’s speed on the attack a real issue, but in possession he worked well in tandem with Matt Leckie. Aaron Mooy had another top performance, out shining his peer in midfield Tom Rogic, who continues to blow hot and cold for the national team. Mooy’s ability to dictate play is well renowned, but he ultimately took up the role of defensive shield for most of it as Mile Jedinak seemed to struggle for match sharpness after a lack of minutes in the run up to Russia. While set plays were a tangible threat, open play attacking remained elusive. Getting Rogic on the ball is essential for progression as they take on Denmark later this week. As said, he’s either on it or not at present, and against the French, he just wasn’t given a moment to breath next to N’golo Kante. A similar fate was felt by Andrew Nabbout, who ran himself ragged in a sometimes solo pressing role in attack but looked often rushed when on the ball. For the first time since 1956, South Korea didn’t have a single shot on target. Oops! OK, so let’s get the (literal) elephant out of the room early. Shin Tae-yong decided to start Kim Shin-wook up top, apparently to deal with “Sweden’s height on set pieces”, clearly forgetting Wookie only really brings height, not strength (or much else for that matter), and eventually being rewarded by his 46.2 % pass completion and only four headers won, all in sterile areas on the flanks. Why? Well, because South Korea were happy, if not outright instructed, to be pinned down very deep in their own half, their willingness to dictate the tempo was almost non-existent (which was, granted, caused by Ki’s below par decision-making on the ball and Koo’s oh-too-visible rustiness, too), and as a result, the Taeguk Warriors were once again counter-attacking with an immobile Wookie leading the line. As if Shin didn’t offer enough parallels with Hong Myung-bo already, here you go – a painful replay of that Belgium game. Kim Shin-wook would, however, make for way too easy a target, and way too cheap a scapegoat in this instance. Make no mistake: this loss falls squarely on Shin’s shoulders. Because if there was one thing Sweden consistently frustrated Italy with in the World Cup play-offs, it was their centre-backs’ ability to head away just about every long ball, and cross. Hence there’s simply no way Shin, or his scouts, didn’t identify that as Sweden’s strength. It’s more likely that Shin – in a very Shin manner – simply wasn’t convinced the said strength is really that strong, and set off to prove it to everyone; fully outcockying himself in the process. And so, the South Korean “Special One” – as he infamously called himself after winning the Asian Champions League – chose not to overload the central areas in the face of the Swedish 4-4-2 with no outright defensive midfielder (which all of us knew Janne Andersson would field), and therefore ignored Go Yo-han as the one fullback who likes to tuck in and combine, instead opting for Lee Yong, whose only big upside on Go YH is his aerial connection with Wookie. The outcome was predictably annoying, or annoyingly predictable; seven attempted long passes, three attempted crosses, with none of those completed. Lee Yong tried it low and high, with no success. As if the Swedes were good at making headers and clearances, or what. This is the worst part. South Korea did have tools to beat this Sweden, who were largely unimpressive themselves, but simply didn’t feel like utilizing them. Ju Se-jong could have offered verticality and some assurance on the pass in place of a struggling Koo Ja-cheol, which the injured Kwon Chang-hoon sadly can’t offer (and boy, how they could’ve used him on Monday). Lee Jae-sung also could’ve done that, if he wasn’t receiving most balls so deep in the pitch, or worse, watching Jang “The Libero” Hyun-soo mindlessly hoofing the ball forward. The Samurai Blue make history as Asia succeeds over South America for the first time. Japan signed off the Round One matches in historic style on Tuesday, claiming Asia’s first ever World Cup victory against South American opposition, beating Colombia 2-1 in Saransk. While the ultimate success was spurred on by an early red card and penalty, the mental strength to come through in the second half was a key step to ensure the Samurai Blue one of their finest victories in their history. The comparison between this side and the one that capitulated so noticeably in Brazil was staggering. As they headed into the break level after Juan Quintero’s expertly placed freekick, flashbacks of the Ivory Coast opener in 2014 went through many people’s heads, and we all know how that came to an anticlimactic conclusion. Instead Japan were invigorated, confident and clear of their way forward, something that needs to credited at the door of new coach Akira Nishino. I admit, I have been one of the detractors against the late firing of Vahid Halilhodzic, and particular to Nishino’s initial squad and lineup selections, but in Saransk the experienced coach showed his expertise perfectly. Japan were in disarray going into the break, they hadn’t controlled nearly as much as you’d have thought they should have with a man’s advantage, Colombia in fact regularly found players in space despite their reduced numbers. It might seem obvious, but the team needed it pointing out to them that they had that extra man! Using the width of both full backs Hiroki Sakai and Yuya Nagatomo early was the initial sign of an urgent change. Nishino had clearly asked his side to stretch Colombia. That with quick transition and isolating the likes of Takashi Inui against the fullback, the South Americans were slowly being worn down. For once we saw a professional managing of the game, a sense of proactiveness when general Japan play has been focussed on counter measures. Individually, Gaku Shibasaki, brought in for Hotaru Yamaguchi in centre midfield, controlled play, fortunate that he didn’t have to deal with either Quintero or substitute James Rodriguez on a regular basis, but drove the side’s build up from deep in the second half. 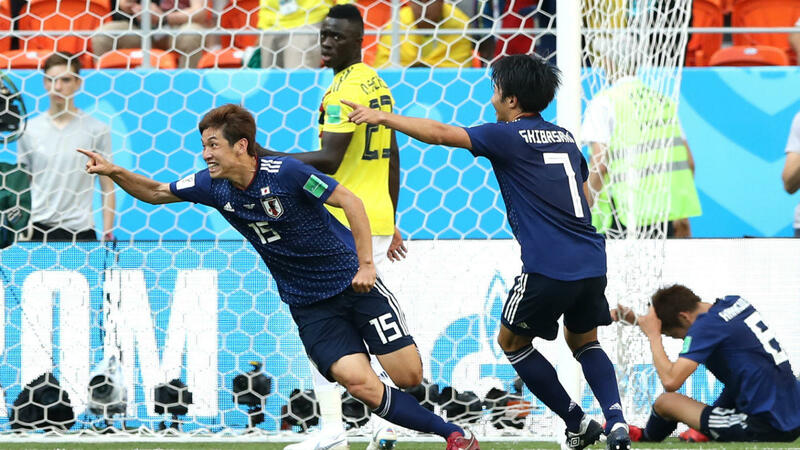 Yuya Osako also needs special commendation, his winning goal aside, he continually illustrated his physical attributes against a world class defender in the making in Davinson Sanchez, regularly beating the Tottenham defender in personal duals, initially to force the penalty and later as he forced a good save from David Ospina. While we may be on a heady high at present, the fact this was done against 10-men, (a sending off to Colombia’s key defensive anchor also), means progress is still required if they are to make it to the knockout stages. The ongoing question around who’s best suited to play in behind Osako still persists, as neither of their talismen of old Shinji Kagawa and Keisuke Honda suitably excelled. There is also the ongoing frustration of Eiji Kawashima starting ahead of his widely accepted successor in waiting Kosuke Nakamura, the former again at fault for Colombia’s equaliser.